The Rebbe explains that missing an opportunity to bring Mashiach eventually results in an even higher manner of his revelation than was previously possible. The fact that the Rebbe's physical presence is hidden from us (although, as Chassidut teaches, the tzimtzum -- withdrawal -- is not truly real) can be understood as a "descent for the sake of subsequent ascent," meant to awaken the messianic spark within us. It is crucial to consider what factors brought about this descent and what exactly the coming ascent should be. It is not enough to simply proceed with the same type of messianic activism in which we engaged before Gimel Tamuz or even to increase it. We must continue to raise Mashiach consciousness, but in a new and totally different manner. The revelation of the light of no bounds whatsoever happens necessarily on the heels of the narrow straits, and therefore 'if you see corrupt generation after corrupt generation, then anticipate the footsteps of Mashiach", for then will be the true revelation of the light of no bounds whatsoever, which is much higher than the revelation of the Exodus, as it says "like in the days of your leaving Egypt, I will show you wonders", when wonders in Hebrew is combined of the words "50 miracles"
After the exodus from Egypt, 86 sparks of Chaos that had splintered off the highest lights in the dawn of creation remained in need of sifting out from within the husks of the other side. These were clarified throughout the long, two-thousand-year exile "with sweat and blood", and in the late twentieth century, all that remain are "small canisters" of sparks, that are still in need of clarification. Therefore we are wise in these times to accept every circumstance that the Holy Blessed One brings us, even if it seemingly takes us away from our "spiritual work", since the main purpose of the final moments before Mashiach arrives is the extraction of the highest concentrations of light in the most unlikely of places, where they have been hiding literally with no caring glance since the first moments of time. The secret of this work is to declare valiantly with all of the heart "When I soar to the heavens there you are; when I reach the depths, it is none but you!" This type of work is not for the masses, but the Ba'al Shem Tov was told that when all are able to do this work, Mashiach will arrive. He was so disheartened when hearing this, knowing how difficult it was to remain rooted in one's higher being, and at the same time know there is nothing other than Him, that he fell into a deep depression upon hearing this prophecy. He eventually recovered, consoled by the greatness of the soul of Mashiach. 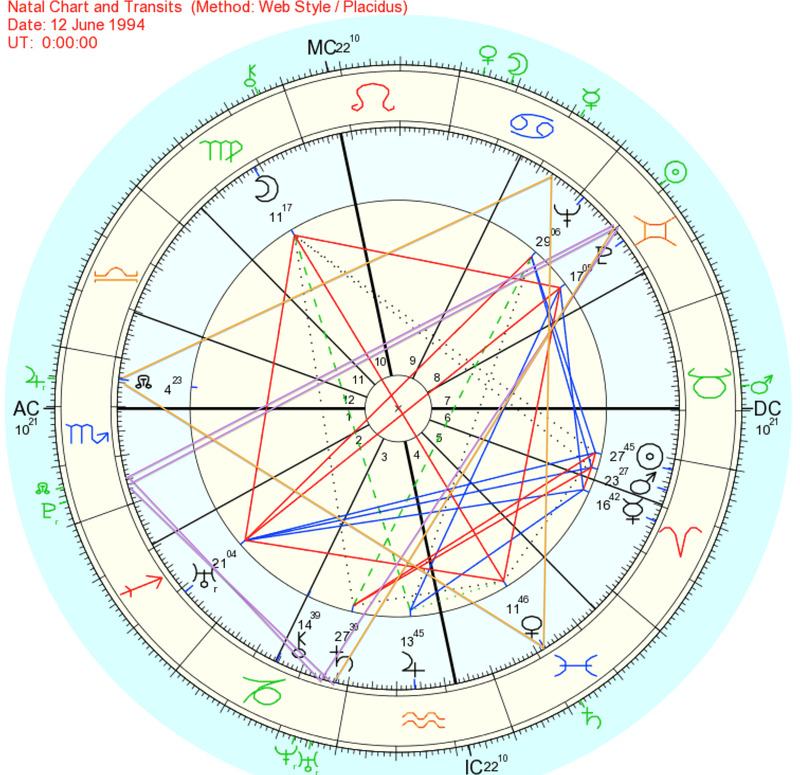 This chart is the Rebbe's birth chart, born 18 April 1902 in Nikolayev, Russia. The Rebbe's birth time is reconstructed as 7:54pm by an Israeli astrologer (a different birth time would affect only some data in the interpretation such as house placements and moon degrees). In honor of today, the anniversary of the Rebbe's passing, this chart also includes transits for 1:50 am 12 June 1994, the moment that the Rebbe transitioned to the world of spirit and is now available to all beyond the boundaries of time and space. * The Rebbe's chart features a grand cross between Pluto in the 8th house (17 Gemini), Venus in the 4th house (11 Pisces), Uranus in Sagittarius, and the Moon in Virgo (10th house). The grand cross is a marker of unique individuals and can also be viewed three-dimensionally as a pyramid that creates a pathway to higher destiny if the individual can overcome the quadrupled tensions between planetary forces that plays out within. In the case of the Rebbe, this higher destiny involved his work in the outside world (10th house), his roots and past (4th house), connection to the feminine (his association with the sefira of Malchut) and unity consciousness (Venus in Pisces), and intellectual versatility and genius in applying ancient wisdom to the highly dynamic context of the late 20th century (Uranus in Sagittarius), bridging old (Venus in 4th) and new (Uranus). For any individual the existence of a capacity for change and revolution along with a deep embedding in a chain of succession of leaders and expectations could create conflict (squares), but with G-d's help such an individual can capitalize on the highly discordant energies to translate the divergent forces within the soul to the birth of something entirely new in the world outside, such as a new movement that brought together the spirit of the age of Aquarius/Mashiach with the deepest teachings of Kabbalah of ancient days, without sacrificing neither an iota of piety and the fire of authentic observance nor a thread of human sensitivity and empathic attitude towards his fellow man and woman. Such a soul seeks not peace but continuous growth and upliftment in oneself and in the world around him or her. * On the day of the Rebbe's passing, 12 June 1994, a day of great loss for the world, when the sheep lost their shepherd, there were two yods in the sky. A Yod is a rare astrological formation highlighting times of a severe buildup of tension that moves a process entirely to a different realm on which the tensions at hand can be resolved by the birth of something new and unheard of. The yods on this day quite interestingly were pointing at the Sun, the most important planetary force for our world and solar system. One had Uranus in Capricorn and Pluto in Scorpio as its base, indicating monumental worldly fueling pernicious messianic fervor and vice versa. Yet both these energies were quincunx with the Sun, the natural order of things, and perhaps something needed to shift to another level, another epoch, the Twin Sun, the Hidden Light, that which can be revealed only in the absence of the leader and in the shattering of the light of the leader into thousands, millions of sparks of light in the souls of all who he had touched, all of whom become lightbearers, invigorated if by nothing but deep remorse and longing to use the small flame inside themselves that had been lit to illuminate further corners of darkness, which light can so often attract and find itself painfully in. The second yod had as its base the node or karmic destiny in Scorpio or the messianic yearning, and Neptune in Capricorn, indicating that perhaps there was also a personal breaking point, echoing what the Rebbe had said a decade earlier, "I have done all I can do to bring Mashiach; now it lies in your hands". Both of the yods pointed, or drove pressure, towards the Rebbe's very own Pluto in Gemini, the other-worldly axis of his own grand cross, in the 8th house of reincarnation and transitioning. It was as if the Rebbe was being called, just as the logs of the energies he had cultivated in this world and global events were producing enough sparks to tilt the scales, it was time for the instigator to move from seen to unseen, and bring the entire process to a new level. * Seeing as the yods in the Rebbe's birth chart with passing transits point towards the 8th house of reincarnation it could be suggested that the soul of Mashiach which the Rebbe carried was returning to its celestial house of study, preparing for its next incarnation. The culmination of the story then lies in the point opposite the apex of the yod, which can be found in the degrees between Sagittarius and Capricorn, which is the site of the Dark Rift and the origin of the cosmos. When the world as we know it was formed, we are told the spirit of Mashiach already existed; the destiny of rebirth and the eternal golden age existed even before the fall; the power of return is the power on which the world is based. In this sense the departure of the Rebbe and his transition to the world of the unseen was a milestone of experience for his flock that that would culminate shortly in the realignment of the cosmos with its own birth point, now infused with self-consciousness, now ready as an awakened being colored by history and knowledge to experience the dream which had eluded it as an infant creation, as it must have been: now, with da'at (knowledge through experience), it would re-encounter the tasting of the Tree of Life, on the eve of Sabbath, in the garden of Eden, amidst peace and brotherhood between all Life, and the full activation and aliveness of all human and natural faculties without any weakness or death. Just as the Rebbe departed through the transpersonal 8th house, the universe will realign with its own zero point. Tonight, Gimmel Tammuz, marks 19 years since the Rebbe's passing. Nineteen years is a sacred number in the history of the Rebbe's lineage, and the 19th of the month of Sagittarius (Kislev) is new year's day for the new inner revelation of scripture that is birthed each solar year. Tonight there are three grand water trines in the sky to celebrate the resilient flow of prophecy that echoes in the Rebbe's chilling absence. They are led on one side between Neptune in Pisces and Saturn in Scorpio, creating a harmony between the inner self-direction of the soul and the authorities that must sanction the arrival of the long-awaited age. On the other the deep wounds of Chiron in Pisces, the absence of the leaders and the leaderless flocks, are galvanized and alchemized into miraculous self-healers and miracle-workers, led by the nodal scorpio, the messianic tug within each soul which awakens in the hour of need when the flock must heal itself and when the darkness itself must illumine, because this is how the system was built, that no darkness could be impenetrable, since darkness itself has always contained light, since darkness is destined to give light, but only when it must, only when, we are left 19 years after with no other way, with no other consolation, other than the alchemizing of wound and loss into scars, and scars into reseviors of self-illumination and beacons of light. This is the deeper meaning of the seating of the Rebbe in Brooklyn, at the gates of Romi, the perch of the self-healer at the precipice between exile and redemption, removing but one bandage at a time from his many wounds, so that, if the moment comes when it is time, he will not have to reapply the bandages all at once, but will have only one to reapply and will thus not tarry. If we are to understand the many wounds of the healer of the generation as the sufferings he experiences as penitence for the generation out of his great natural love for closeness between humanity and G-d, and the wounds of the generation as they reverberate through the collective soul as Chiron, which holds as well the potential for alchemizing wound into self-illumination and the drawing down of all G-dly powers into the flesh, we see that the application of the bandage is the discovery of the self-healing and Godly rivers within the soul, which, once they begin to flow, are infinite and therefore ready to heal all wounds of self and other, which are one and the same. Because all wounds result from the disconnection between the infinite and finite, and the reconnection of the link between the two found through the wounds of the healer are enough to ignite the connection for the soul of humanity as a whole. This is the importance of the soul of each generation which has within it the blueprint of all souls, and of the spark of each soul which is united in the collective soul. When the darkness of the collective souls illumines, the white fire behind the black fire of the letters of the Torah shines and the root of all people in Torah is revealed, and new waters of the miracle of the soul, of knowledge, of wisdom, of humanity and of creation flow down onto the world and onto the souls of all who desire wisdom, all who have reached the point at which such a revelation is inevitable, built into the very structure of the universe, instigated by the removal of the last beacon of light, and the dawning of the revelation of the great ones as never before. Planetary positions for today can be seen here.